As perhaps thousands of people now know, my conflict (for lack of a better word) with the Boone County Courthouse didn’t end a month ago. the judge declared a 30-day ban for me to enter the Boone County Courthouse effective Dec. 15 unless I filed a request for a hearing. What the vast majority of those people do not know is this: I never declined that second opportunity. Additionally, the 30-day ban has — as of yesterday around 10:45 a.m. — been lifted. express my gratitude to the many who helped me and supported me through this tough time. This account will be told chronologically. As was the case with my first account pertaining to this incident, it will be long. But so many people have read my account about how I made my mistake and tried to atone for it, and I can only hope that at least half that many will read this follow-up. As was published first in a Columbia Daily Tribune article and then picked up by the Associated Press, I received a statement from the court on Friday, Nov. 20. This statement came almost a full month after the Missourian director of photography, the photo editor who edited with me on that assignment and I sent letters of apology to the judge. Click on the image to view/download the full-resolution PDF file. Two weekends ago, Jeff and I spent three days in Houston for my brother Matt’s wedding. Although we were not the wedding photographers, we both brought cameras. Of course. Jeff shot digital, which means his photos were up and ready the next day. I shot film, which means my photos are just now ready. There’s a reason why I shot film, and particularly Tri-X 400 film. I’d grown up poring over photos shot by LIFE photographers. The black-and-white photos of JFK and Jackie’s wedding always struck me as wonderful wedding photography, and I wanted to capture a similar, candid look using black-and-white film. 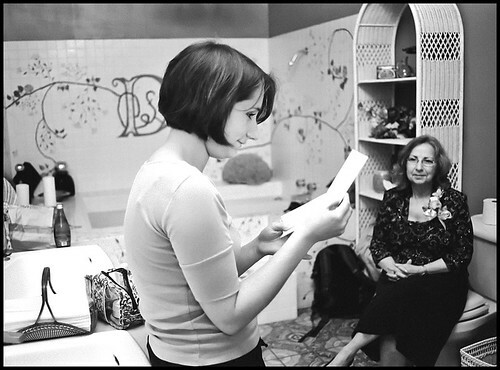 In the bride’s dressing room an hour before the wedding, Emily reads a card sent up to her from Matt. 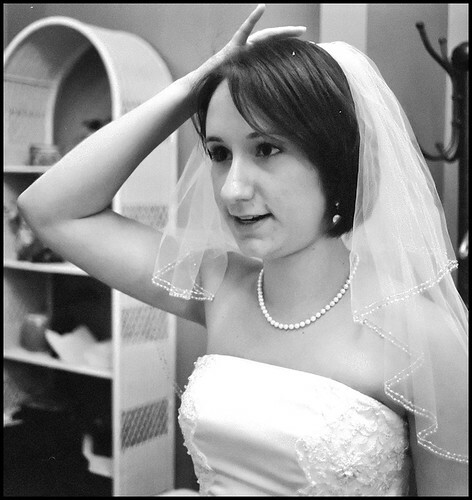 As a bridesmaid, I had special access to the bride’s dressing room at the Richmond House, where the wedding and reception were held. I knew the hired wedding photographer wasn’t scheduled to arrive until shortly before the ceremony, so I happily took it upon myself to capture some small moments among the girls. Somehow, Missouri got it together and knocked the socks off of Kansas State yesterday, when the Tigers pulled off a 38-12 victory in Manhattan, Kan. This was a victory completely unexpected by almost everyone I talked to before leaving for the “Little Apple” to photograph the game. A player (yet to be identified) embraces Missouri junior tailback Derrick Washington (No. 24) after Washington ran a 13-yard touchdown in the fourth quarter. But I’m not here to ponder, consider or explain how or why the Tigers secured their victory. Senior Leslie Horn reaches out to senior linebacker Sean Weatherspoon after Missouri defeated Kansas State 38-12 at the Billy Snyder Family Stadium in Manhattan, Kan. I am (surprisingly) reasonably comfortable shooting college football now. All this means that, now that I know the game and know I can get the action, I can and should focus on working different angles and getting shots unlike what editors, fans and readers expect to see from a football game. But as it is for now, I’ve got a few action shots from the game I’d like to share with you. As I have previously mentioned, Jeff and I escaped the clutches of the greater D.C. area to spend three days in New York City in the beginning of August. 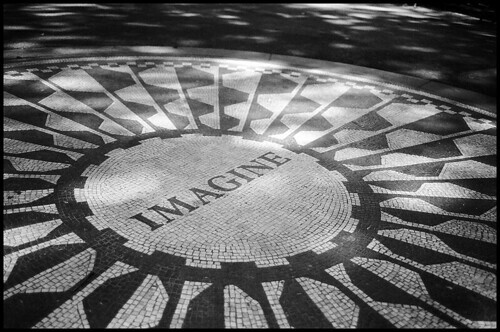 Strawberry Fields in Central Park on Friday, Aug. 7. We spent those three days seeing the sights, mostly in Manhattan and mostly through our camera viewfinders. Jeff had his D700; I had my 30D and Olympus OM-1. Here’s the conundrum: I shot on black-and-white film. 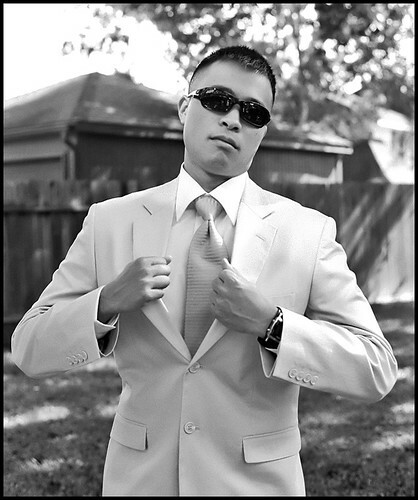 Which means I have color photos (from my 30D) as well as black-and-white. The color photos are wonderfully vibrant, whereas the black-and-white photos lend a more old-fashioned look at the city. Because of the different moods they present, I’ll post the color photos separately from the black-and-white photos. But today, I’m starting out with a bit of each. Our bus from D.C. arrived two blocks from the New York Times building. So of course we stopped by the NYT before doing anything else. We arrived via bus in Manhattan on Thursday evening. 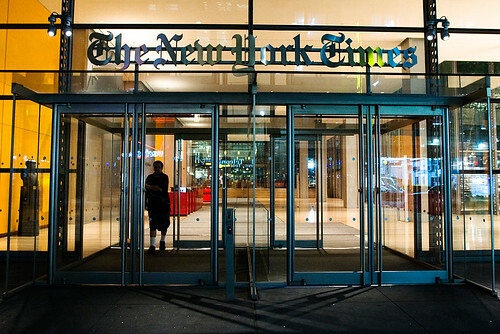 After swinging by the New York Times building — no longer in Times Square — we dropped off our luggage at my uncle’s apartment in the Upper East Side and ate dinner at a small, nearby diner. Where I had homemade ravioli for the first time ever. It was incredible. 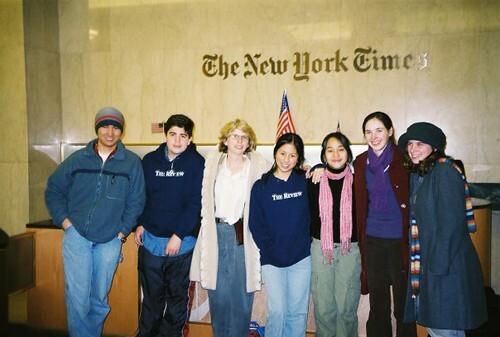 By the way, here’s a photo of fellow Review staffers and me at the New York Times building in 2004, back when it was still in Times Square. Did you know Times Square was named after The New York Times? From left to right: Andrew (future business manager), Armin (future sports editor and managing editor), Mrs. van der Pol (adviser), me (future features editor and EIC), Chanel (future news editor), Morgan (future scrivener, features editor and managing editor) and Anna. As staff of our high school newspaper, we spent spring break in the city for the Columbia Scholastic Press Association conference. Jeff and I started out the next morning (Friday, Aug. 7) at Central Park, which was only a few blocks from my uncle’s apartment. We didn’t spend that much time there, though — lower Manhattan and Brooklyn were calling our name. But of course we took some photos. Panoramic view from the north end of the lake in Central Park West. This will probably be the only entry with both color and black-and-white photos. I’ll be posting more photos over the next week or so. Stay tuned! 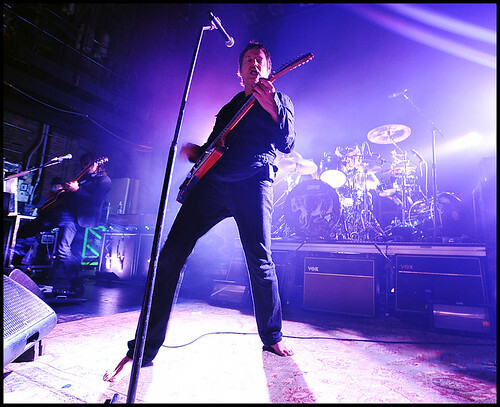 Third Eye Blind lead singer Stephan Jenkins likes to perform barefoot, apparently. As I wrote last week, I photographed a Third Eye Bind concert last Tuesday. Two projects and a wedding weekend later, and upon the insistence of my friend Cat, I’m finally posting these photos. 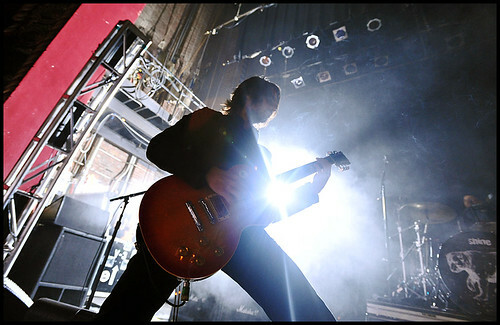 Third Eye Blind guitarist Tony Fredianelli. When I was assigned to cover the concert, one of the editors referred to Third Eye Blind as “everyone’s favorite band from 2000.” Since I’ve had my head (and ears) stuck in a 1960s/70s rut for the past 21 years, I wasn’t sure I was familiar with the band’s music. So Jeff had me listen to six or seven songs. And of those, I immediately recognized at least five from the opening chords. It was definitely a throwback to contemporary radio play during my adolescence, and it definitely helped explain why the concert at The Blue Note was sold out. 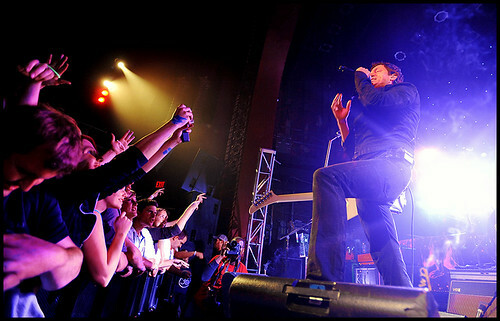 Last night, Third Eye Blind played a sold-out show at The Blue Note. I was there not as a fan, but as a photographer for The Missourian. But before I photo’ed the show, I wandered downtown Columbia a bit. 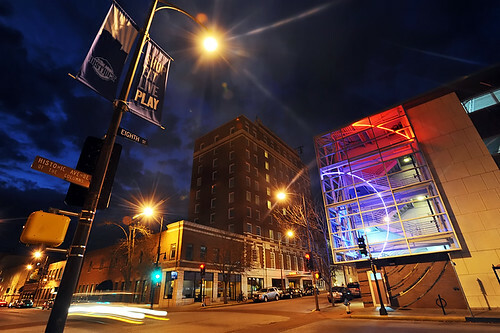 When I first came to Columbia three years ago, I fell hard for downtown. Having an eclectic assortment of restaurants, shops, services and government buildings right at my doorstep was a complete novelty after living in Houston for my entire life. 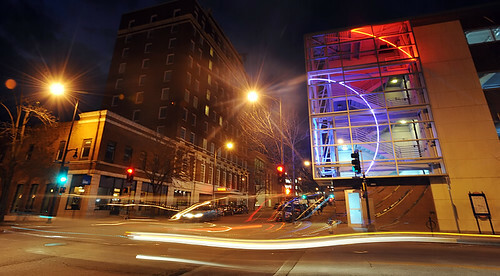 Within a month of living in Columbia, I knew downtown better than I knew the MU campus. Then I started exploring downtown at night. And downtown at night is a completely different creature. 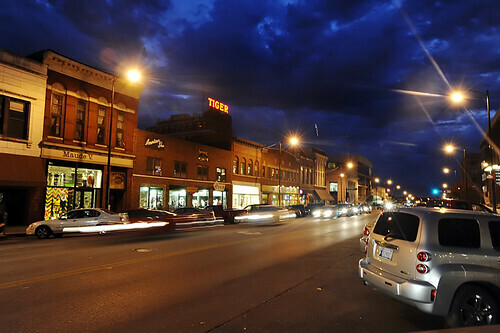 This was the first time I had time to wander downtown at night since at least April, and the first time I’d done so with a camera since freshman year. So I kept it simple. Having no tripod, I couldn’t hand-hold long exposures for too long. I’ll have Third Eye Blind photos up either later tonight or tomorrow before I leave for Houston for my brother’s wedding. No, I’m not the wedding photographer. But I will be bringing my film camera and a roll of black-and-white! As for the severe lack of photo updates this past month? I’ll get on it. I promise.